Delays obtaining ultrasounds have been cited by some women seeking abortions in Nova Scotia as a barrier to accessing the time-sensitive service, whether a surgical procedure or a medical abortion using pills. A new ultrasound machine fundraised for Nova Scotia's only abortion clinic is sitting idle, with health authority officials refusing to allow doctors to use the diagnostic imaging equipment to date pregnancies. The machine arrived at the Women's Choice Clinic at the QEII Health Sciences Centre in Halifax this month after a fundraising campaign collected $60,000 through a private foundation and local donations. Dr. Mark Taylor, acting vice-president of medicine for the Nova Scotia Health Authority, says a plan for the new ultrasound machine — and who will use it — will be discussed at a meeting later this month. For now, he says the clinic has access to dating ultrasounds — usually on the same day as a procedure — through registered sonographers in consultation with trained radiologists. "There is currently no plan for physicians to be conducting dating ultrasounds in the clinic," he said in an emailed statement. He added that while there is no policy forbidding doctors from performing dating ultrasounds, there is "training and expertise required both to conduct and interpret ultrasounds." 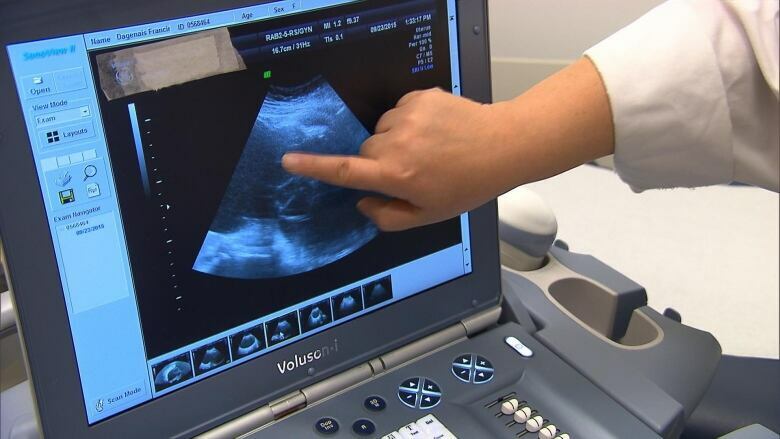 Lianne Yoshida, the medical director of the clinic, said in an email that while the details for the ultrasound's use are still being discussed, she's hopeful it will work out soon. In a previous interview, she indicated that a so-called bedside ultrasound would improve the clinic's services, and help doctors confirm when an early abortion is complete. Health Department spokesperson Tracy Barron said eight ultrasound appointments per day are reserved within diagnostic imaging for dating pregnancies for the purposes of an abortion. "Same day appointments eliminate the previous barrier that required multiple appointments," she said. "Ultrasounds are not a barrier to access." Meanwhile, advocates have said the requirement for an ultrasound before obtaining a medical abortion using pills has become a barrier in some cases — particularly for women in remote and rural areas. A Cape Breton University student told The Canadian Press she waited nearly three weeks to obtain Mifegymiso, a delay caused by billing issues, finding a doctor and waiting for tests. Frederique Chabot, director of health promotion with Action Canada for Sexual Health and Rights, said waiting for an ultrasound appointment in some regions of the country can delay abortions by weeks. Given the abortion pill is only available within the first nine weeks of pregnancy, she said the delay could put Mifegymiso out of reach of some people. "If you have access to a timely ultrasound, that's great," Chabot said, but added that making women wait weeks is unacceptable. "It feels urgent and it is urgent because there are consequences if you delay access to abortion," she said. Dr. Dustin Costescu, a family planning specialist and assistant professor in the Department of Obstetrics and Gynecology at McMaster University, helped shape the national guidelines for Mifegymiso, a two-drug combination used to terminate early pregnancy. Although Health Canada requires an ultrasound to be performed before Mifegymiso can be prescribed, he said that requirement should be examined if it's delaying some women's access to timely medical abortions. "Ultrasound access has become a major barrier," he said. "This was somewhat unexpected." In France, only about 30 per cent of women have an ultrasound prior to obtaining a medical abortion using pills, Costescu said. Doctors in Canada have the option of waiving the ultrasound requirement and prescribing Mifegymiso "off label," but he said this may expose them to legal risk.